The daily number of tourists permitted to visit the Mogao Grottoes will be limited next year in a bid to better protect the frescoes inside, according to the Dunhuang Academy. Statistics provided by the academy show that 3,000 to 5,000 tourists visit the ancient relics every day during the annual May-October tourist season, surpassing the Mogao Grottoes' estimated daily capacity of 2,900 people. "The proper daily capacity was determined scientifically, and we plan to progressively limit the daily number of tourists into the caves," Fan Jinshi, head of the academy, was quoted as saying by Gansu Daily. The director said that though the Mogao Grottoes are spread over a large area and have many caves, each of the caves is actually quite small. Eighty-five percent are smaller than 25 sq m.
Both the caves and the frescoes inside would be better served by having fewer people passing through. 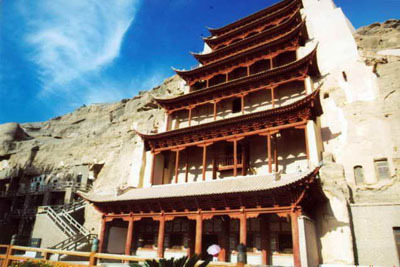 The constant temperature inside the cave and dry weather outside have helped preserve the Mogao Grottoes, Fan said. A simulation carried out by the academy's technicians revealed that constant changes in the relative humidity inside the caves damaged the ancient frescos. "Prolonged exposure to carbon dioxide and the increase in the relative humidity inside the caves will hurt the frescoes," the test report said. It will not take long for the damage to the frescoes to become evident, and it is likely that it will accelerate, Fan said. The Mogao Grottoes, located in the southeastern suburbs of Dunhuang, in northwest China's Gansu Province, were built in AD 366. Today, the 492 caves still house many Buddha statues and frescoes. It is one of China's hottest tourist destinations and a world-renowned piece of cultural heritage. The Dunhuang Academy, which is responsible for the conservation, management and research of the Grottoes, has been looking for ways to protect the ancient relics and has made several breakthroughs in preserving and repairing them, Fan said. The Mogao Grottoes were officially opened to the public in 1979 and have received more than 4 million tourists from both home and abroad. That number has increased in recent years to an annual rate of 300,000 people, and the number of tourists is expected to reach 500,000 annually within five to 10 years, local tourism administration sources said.